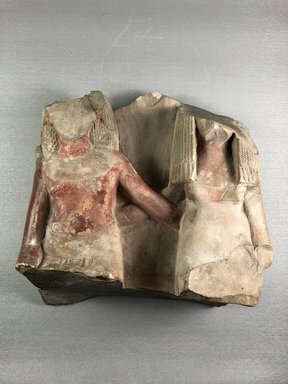 Fragment of a limestone statue of a seated couple. The couple are seated against a high back slab. The rear surface of this back slab is decorated with an inscription in plain-incised hieroglyphs. The mans is identified as the “Overseer of the Fields of Amun W…” or ”Overseer of the Fields, Amun-w…”. The man is seated to the right of the woman. He wears a double wig, the upper part of which is striated, and the lower part of which is curled, “en echelon”. The absence of red paint in a band around his neck indicates that there was once a painted representation of a broad collar. The figures’ right hand would have rested on the right knee (both hand and knee are not preserved-the entire piece is not preserved from shortly below the waists of the two figures down). His left arm extends downwards and outwards to pass behind the figure of his wife. He wears what was once a long skirt. The top of the skirt is decorated with a hooked border. Running down the center of the kilt is a band framed by two pleats. On this band is the remains of an inscription. The man’s navel is indicated, but there is no indication of a median line. The woman also extends her arm to hold her husband, and on both figures the hand of the figure’s spouse is visible on the outer side of the figure. The woman wears a long heavy wig with zigzag-shaped locks tied at the bottom. There was once a painted representation of a broad collar on the figure of the woman. Her dress has a trapezoidal shaped neckline. There are traces of white paint on the woman’s dress and traces of red paint on her skin. There are also traces of red paint on the man’s wig. Condition: Missing are the top of the back slab, the faces and the tops of the heads, and the entire piece from shortly below the waists down.